Back in early December, a friend of mine spotted, what was thought to be a young Orchard Oriole in Union Square Park in Manhattan. Baltimore Orioles around NYC during the winter are unusual, but not unprecedented. 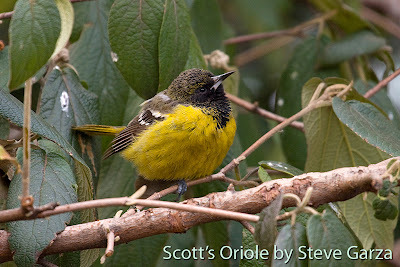 Regarding late Orchard Orioles, however, "Bull's Birds of New York State" states, "Unlike its cogener, the Baltimore Oriole, this species has never been recorded in NY between Oct and mid-April." Had the person been aware of that fact, and taken into consideration 2007's extraordinary list of extralimital species of birds that showed up around New York State, it might have warranted a closer look at the bird. 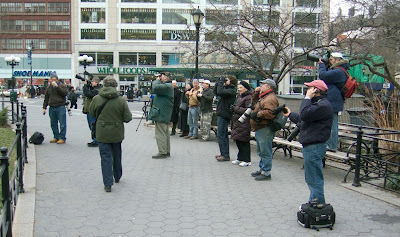 For over a month, Union Square's brightly colored visitor went largely unnoticed by New York City birders. 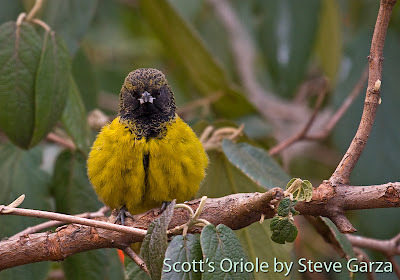 On January 24th, someone went looking for the bird and correctly identified it as a Scott's Oriole. It is the first time that this southwestern bird has been recorded in New York State. 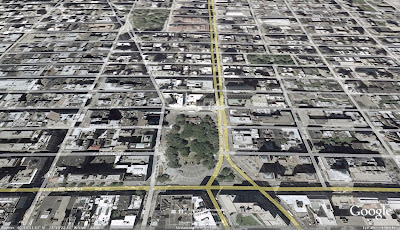 As soon as the information hit the Internet, droves of people began heading to Broadway and 14th Street. Union Square Park is not so much a park as it is a plaza with statues, some patches of grass and trees. The hungry oriole, for whatever reason, passed up Central Park's 843 acres (or any of the other large expanses of nature in NYC) and came to rest in a park that is not known for its natural surrounding, but rather political rallies, demonstrations, greenmarkets and an equestrian statue of George Washington. This past Sunday I rode the "R" train from Brooklyn to Union Square hoping to get a look at the oriole. The directions that were posted on the Internet to the Scott's Oriole's preferred habitat were pretty simple. It's about 20 yards from the subway entrance, in the small garden behind the Mahatma Gandhi statue. It was one of the most unusual directions to a rare bird that I've ever read. There is a holly tree in that area that a Yellow-bellied Sapsucker has been using as a food source. The Scott's Oriole discovered the dripping sap and has been seen regularly feeding at the holes. He also feeds on scrapes of bread, fruit and other "city bird" junk food. There were about a dozen people present when I arrived, so it wasn't hard to figure out where the bird was frequenting. The first person I approached said that it hadn't been seen in the expected location for about 30 minutes, so I strolled around the 3 acre park looking in other spots. Like most open spaces around Manhattan, the wildlife in the park is a very short list; Rock Pigeon, European Starling, House Sparrow and Eastern Gray Squirrel. There is also a small dog run, if you want to add domestic dog to the mix. I looped around the park's interior foot path and the north end's greenmarket then headed back to the Gandhi statue. While I was waiting for the oriole with a group of other birders, Ed Coyle yelled to us, "It's over here". He was standing about 50 yards east of us and was pointing up at a bare cherry tree next to the statue of George Washington on his steed. In retrospect, it seems kind of silly, but I actually ran to where Ed was aiming his camera. The oriole stood out like a lighthouse on a stormy night. You couldn't miss it as it perched only about 10 feet up and right next to the sidewalk. I watched it for about 1 hour during which time it moved back and forth between a dirt strip at the south end of the dog run and, what I now know, is officially named the "Gandhi Gardens". 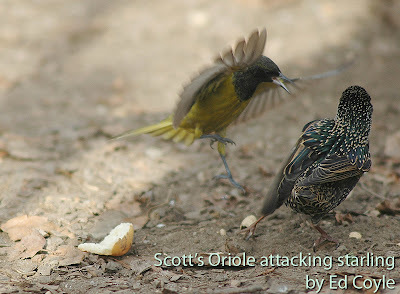 At one point, the aggressive little bird attacked a starling that came too close to his piece of bread. Shane told me that while he was watching the oriole, it was drinking from the sapsucker's tap holes when the sapsucker returned to feed. The Scott's Oriole proceeded to chase the small woodpecker to the ground where it gave it a sound thrashing. Now there's gratitude for you, beating up the provider of his sweet drinks. I've been wondering why he chose that particular patch of plants in Union Square Park. It might be because it is the only spot in the park with any diversity of fruiting plants. There are some low wildflowers and grasses bordering the garden, but much of the ground has been worn down to the soil by the local wildlife. Dominating the larger plants is a young pine, a single American Holly tree and a grouping of berry-less winterberry shrubs. Either the winterberries are all male plants, or the birds have already eaten all the bright red fruits. Yesterday I was at a meeting on lower Broadway. When I left the meeting at a little past 2:00PM, the rain had stopped and there was a blinding, winter sun in the sky. I decided to stop by Union Square for another look at the Scott's Oriole. The wind had really picked up since I left my home in the morning and it felt a lot colder than I anticipated. It made me think about the weather conditions this oriole should be experiencing 1500+ miles west, where he hatched last year. Hopefully, he'll realize that he's on the wrong side of the continent and eventually fly back. When I arrived the oriole was perched out of the wind in one of the winterberry shrubs near the sidewalk on the west side of the garden. I didn't have my binoculars, but he was so close that it didn't matter. I had my little point-and-shoot Canon camera with me and decided to use it to shoot some video. At around 3PM he flew to a shrub that was only 8 feet away from me. He hopped down to a low branch, then on to the ground where he began picking at the remains of a discarded banana. The floor of the garden is about 3 feet higher than the sidewalk. A stone retaining wall is topped with a low, wrought iron fence. 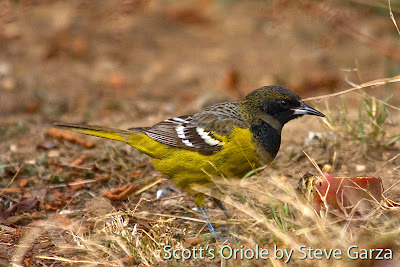 The Scott's Oriole was about 6 feet away from the fence. There were several birders standing behind me and, since I'm tall and didn't want to block their view, I knelt down on the sidewalk where I had an eye level view of the bird. His feathers and the silver base of his bill gleamed in the intense, winter sunshine. As I watched the bird from the southwest feeding on pieces of a tropical fruit it felt like the wind subsided and the blustery afternoon momentarily warmed up. I walked the short distance to the subway entrance and went back to Brooklyn. After watching the two Red-tailed Hawks courting in the woods behind the zoo, I began to think about the first hawk nest that I closely observed. The year was 2002 and it was a pair that became known as Big Mama and Split-tail. 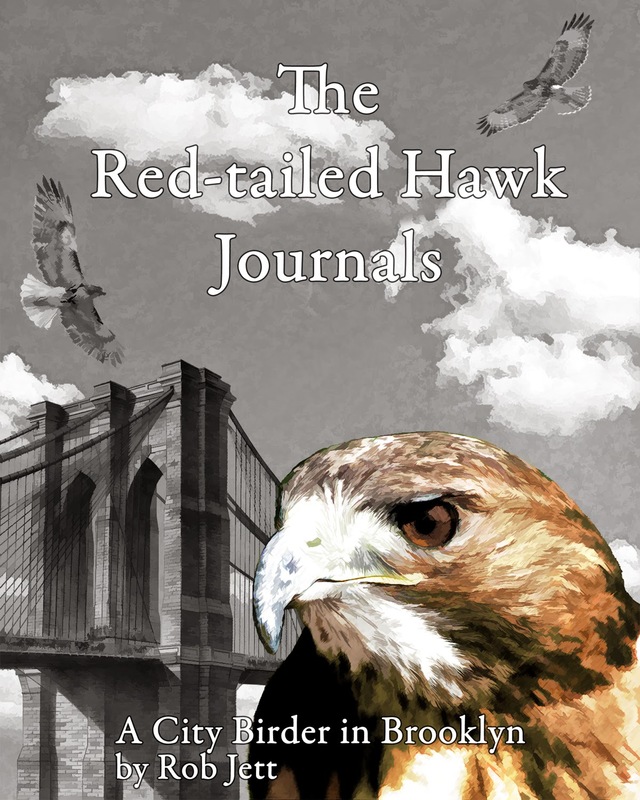 For various reasons, many people more experienced with urban Red-tailed Hawks believed that it was their first nesting attempt, but they sucessfully raised 2 young. In the following years Big Mama and Split-tail reared 5 more offspring of which 2 died of the disease frounce. Big Mama went on to pair with a younger male named "Junior". They subsequently moved to a nest in Green-Wood Cemetery where they've raised three offspring in 2 years. 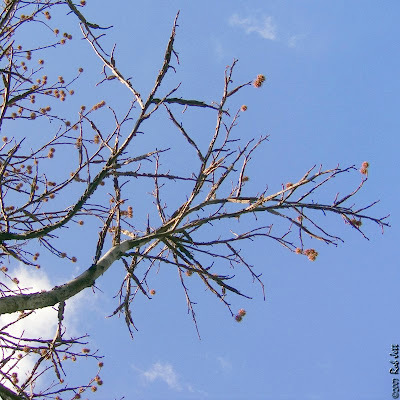 At the top of the rise is a small tree that leans over at a slight angle. 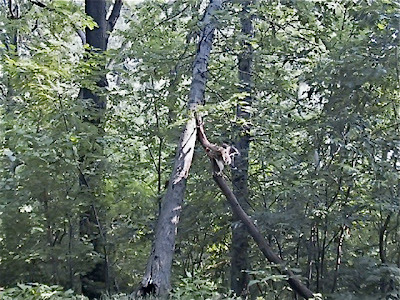 The young raptor had checked it out a couple of times earlier but had trouble climbing up it, as the angle was perhaps a little steep. I had an idea that I thought might help. I located a very long log, dragged it out of the woods and leaned it against the tree at a lower angle. I hoped that our wayward friend would use it to climb to higher ground. It didn't take long but sure enough it climbed up on it and began making its way up the tree (that log has now become known as "Rob's Hawk Ladder"). As we were playing raptor herder momma Red-tailed Hawk remained perched above us most of the time. By about 12:30pm the little one had made a lot of progress and was about 12-15 feet back up in a tree. Meanwhile, the older chick (who we had completely forgotten about) had flown into a Sycamore Maple about 30 yards south of where we had been watching it earlier. It has completed the flying exam and passed with, well, flying colors. As nervous as we all were when the younger hawk was running around on the ground we were relieved once it made it back up into the tree. The chick is probably only a day behind its sibling with regard to development and I feel confident that by tomorrow it should be fine. I went for a bike ride in Prospect Park late Sunday afternoon. After one lap around the park, I rode into the open area above the Vale of Cashmere. The area's official name is "The Rose Garden", but I've been told that there haven't been roses there since the 1940's. It should be renamed "The American Yew" garden, for all the yew shrubs that border the grass field with non-working decorative fountains. I took that route because it allows me to ride down the paths into the Vale of Cashmere, then continue cycling passed Nelly's Lawn, through Battle Pass and into the Midwood. I get bored if I just stay on the road that loops around the park. Someone had put out mixed bird seed next to the ponds in the Vale. A squirrel was chowing down, while the birds waited their turn. There was a flock of about 30 Mourning Doves perched in a tree above the ponds. As I passed beneath them another 20 or so flushed from the brick sidewalk and muddy hillside. 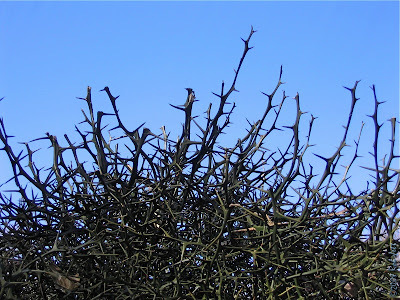 I stopped briefly to speak with a woman who appeared to be clipping branches from a thorny shrub. People sometimes take a lot of liberties in Prospect Park, so I stopped to say hello and see what she was doing. It turned out that she was a botanist and was just clipping a couple of tiny, dead branches for samples. Neither one of us were certain of the plant species. I've looked at that plant hundreds of times as I'm fascinated its beauty and intimidating nature. As I was pedaling towards Battle Pass I heard the chirping call of a Red-tailed Hawk. It wasn't the typical, wheezy "keeeerr", but the short, high-pitched notes that I usually associate with fledglings begging for food. 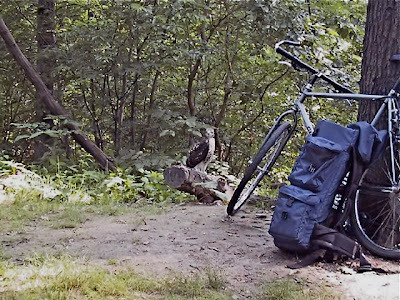 My bins always come with me when I go into the park, even if I'm just going for a bike ride. I'm glad I had them with me yesterday. 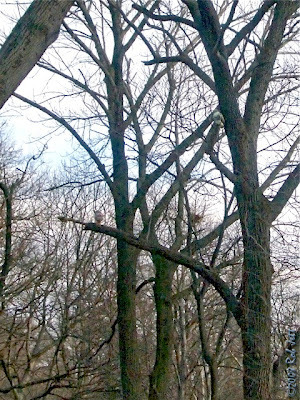 After a brief search I located a large, adult red-tail perched in the North Zoo Woods (I recently found an old Prospect Park map and discovered that the area in question was originally named the "East Woods"). I leaned my bike up against a tree and watched her calling. Within a few minutes, her mate flew in from the woods west of me. He had a fresh kill in his talons and placed it on the branch next to the calling female. She accepted the gift and he flew to a perch just above her. He sat and watched for several minutes as she tore into, what looked like, a baby squirrel. 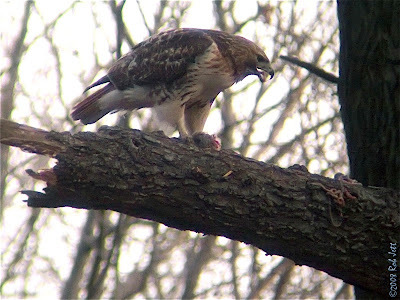 It may only be January, but Red-tailed Hawks are already preparing for the breeding season. 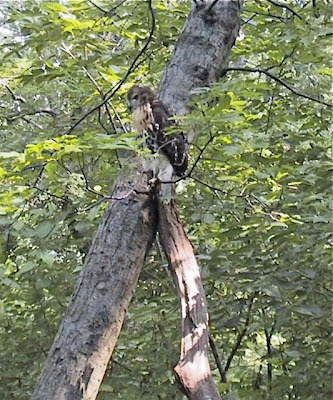 Marge called on Saturday to tell me that she spotted one of the released juvenile Red-tailed Hawks in Green-Wood Cemetery. She also said she witnessed Big Mama and Junior talon-grappling in the sky above the cemetery. Ah, love is in the air. About 30 minutes later I was riding along Center Drive when I spotted four people staring up into the woods of Quaker Ridge. I figured that they were looking at a red-tail. Valerie was one of the people. I rode over in time to see two or three Red-tailed Hawks fly off towards Lookout Hill. She told me that three juvenile red-tails were playing together in the woods. I asked if any were banded, but she didn't have her bins and couldn't tell. The hawks were soaring over Lookout, so I pedaled up the road and turned onto the path to the top. I found one hawk perched in a tree near the Butterfly Meadow, and another was flying just above. I didn't see a third, but ran into another birder, named Rob, who also said that three juveniles had been playing around in the woods of Lookout Hill. 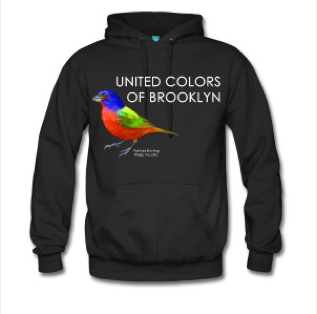 They were last seen flying out of the park towards the Green-Wood Cemetery. 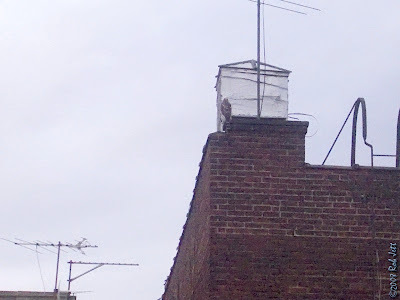 Our neighborhood hawks sure like to perch on the building opposite our kitchen. 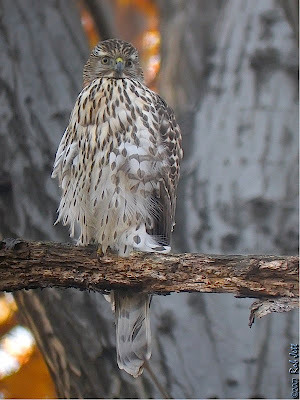 During breakfast this morning my wife said nonchalantly, "Looks like the Cooper's Hawk is back". I leaned over to the window and looked across the courtyard to the roof of an adjacent building. The hawk wasn't perched on the antenna, as I expected, but on the corner of the roof. It also wasn't a Cooper's Hawk, but a juvenile Sharp-shinned Hawk*. That's a first for our "backyard". There's a flock of pigeons that roosts on the next building over, unfortunately, he'd have little chance of catching one. He was scanning the ground for something a bit smaller, maybe a junco, White-throated Sparrow or House Sparrow. After we cleaned up our breakfast dishes, I took another look and he was still on the roof. 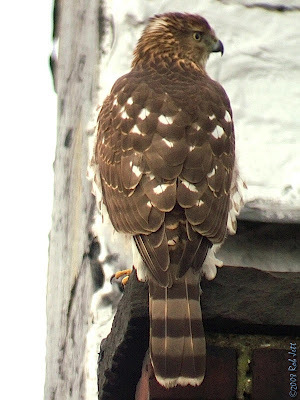 That brings our roof raptor list to 4 species; Sharp-shinned Hawk, Cooper's Hawk, Red-tailed Hawk and American Kestrel. There is a very narrow stretch of backyards between the buildings on our block, but I guess it attracts a lot of prey. 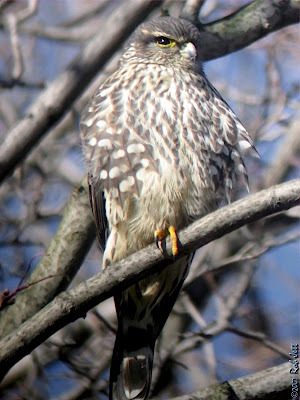 *Sharp-shinned Hawks and Cooper's Hawks are notoriously difficult to tell apart in the field. My assumption that it was a sharpie is based entirely on its very small size relative to the ledge and bricks. I measured a brick outside my window and it is only 2" thick. Also, he looked tiny compared to the pigeons that were flying past. 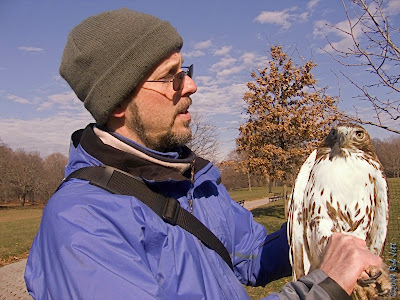 Friday I had the honor of participating in the release of three rehabilitated Red-tailed Hawks. They were first year birds that were injured in Brooklyn and brought to "Wildlife in Need of Rescue and Rehabilitation" on Long Island. Bobby Horvath operates the small facility and I've mentioned some of his rescues in past postings. Bobby and I have corresponded for over a year, but we had never met. 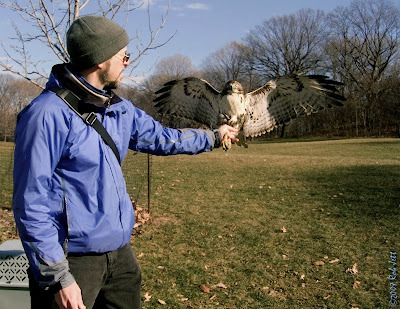 When he was planning to release some hawks in Brooklyn he asked if I'd like to be present. 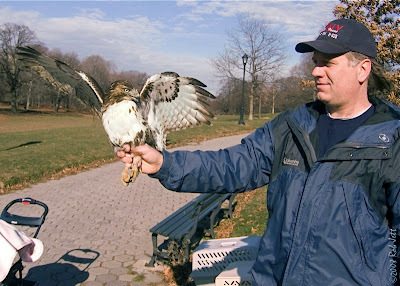 I was thrilled with the idea of being up close with the hawks and watching them fly off into the wilds of Brooklyn. Imagine how I felt when he asked me if I'd like to hold, then release one of the hawks. I tried to act all cool, like it was an everyday event, but I was jumping out of my skin with excitement. It was a crisp 30 degrees and there was a steady wind blowing in from the west. Bobby and another rehabber (I was so focused on the hawks that I can't remember her name) took the first hawk out of its carrier. It seemed surprisingly calm and composed. When he was faced into the wind, he instinctively opened his wings to catch the uplift. The first bird was released and headed towards a huge linden tree to the north. It perched near the top of the tree. As they extracted the second bird from the carrier they asked if I'd like to release it. Well, yeah! Bobby showed me how to hold the hawk. He also explained that I shouldn't be worried about the bill, as they won't bite me. Their talons were another story. Given half a chance, they'd put a few good sized holes in me. 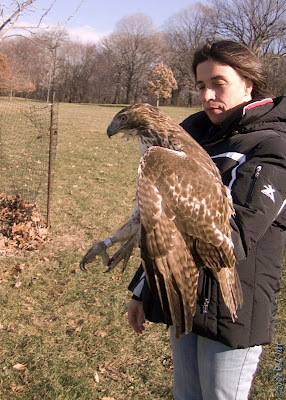 I held the young Red-tailed Hawk firmly around his legs. He was a relatively small, male bird. The hawk seemed relaxed and imposing as he scanned his new surroundings. When it was time to let him go, I faced into the wind and opened my grip on his legs. I didn't have to toss him in the air or give him any kind of help. He just opened his wings, caught the wind and effortlessly ascended into the air. The raptor made a wide, arcing turn and found the tallest tree to land in and survey the new setting. The third hawk flew off in the same easterly direction. 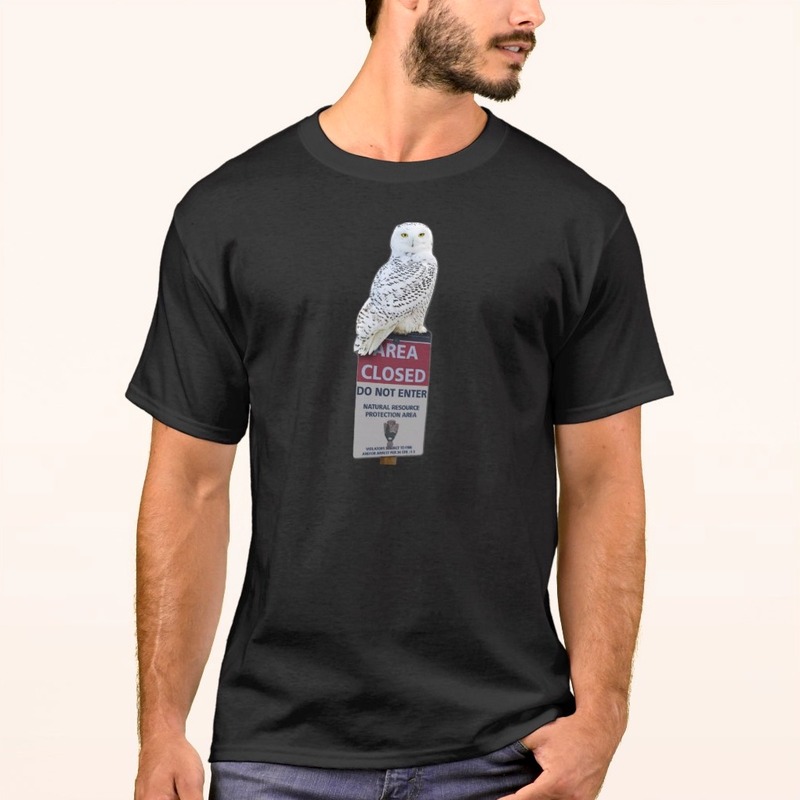 Later, as Bobby and his assistant were closing up the empty carriers, Bobby spotted one of the Red-tailed Hawks taking off from his initial perch and heading over the trees. When the bird flew out of sight, Bobby had a smile and look of satisfaction on his face. What a difference a year makes. 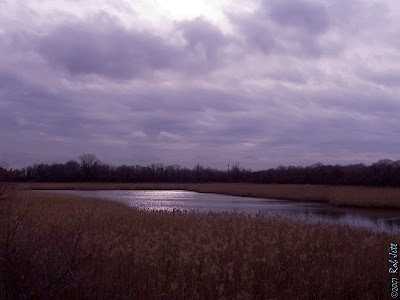 In 2006, Sean, Shane and I rushed around New York State collecting bird sightings. For 2007, our priorities were such that we spent very little time birding together. My involvement with the Ridgewood Reservoir project kept me more focused on that conservation issue and less so on personal bird listing. I went from seeing 315 species in the state in 2006 to 249 in 2007, but I have no complaints. Birding has made me more aware of our seasonal cycles in the Northeast. It has also made me wonder about the logic of our calendar. We begin the year in the middle of winter and end the year in the middle of winter. I suppose it makes sense somewhere in the world. 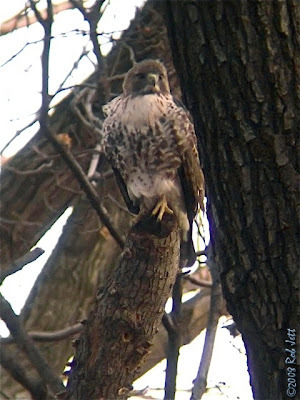 In January of 2007, I spent some of my time watching a female Merlin that overwintered in Prospect Park. As winter rolled around again, I ended the year crossing paths with a Northern Goshawk who had moved into Prospect Park in November. On Saturday, December 29th, I rode the "J" train over to Ridgewood to meet someone. The sky was dark and threatening, so I didn't stay for very long. Leaves have fallen from all the trees in the basins, giving a very different perspective when looking across the tops of the forests. I put my camera on the tripod, pulled the legs all the way out and extended the center post to its limit. With the self-timer set to 10 seconds, I hoisted the tripod as high as I could and faced it into basin 3. The resulting images are nearly unrecognizable from the lush, green habitats of spring and summer. 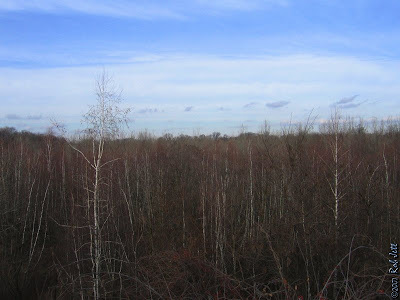 Rows of bare, slender Gray Birch trees stood up like quills on a porcupine. While waiting on the platform of the elevated train station, I noticed a large flock of pigeons swirling around above an apartment building west of the reservoirs. The swirling, undulating mass of birds was hypnotic. Suddenly, the organized movement of the flock was interrupted and they split off into chaotic groups. A Peregrine Falcon was plunging headlong through the center. She missed her target and circled back up above the pigeons as they regrouped. On a second pass she hit one bird and it started tumbling, but righted itself after a few seconds. I expected to see the falcon swoop in for the kill, but instead, a second, larger Peregrine Falcon appeared and the two began fighting. 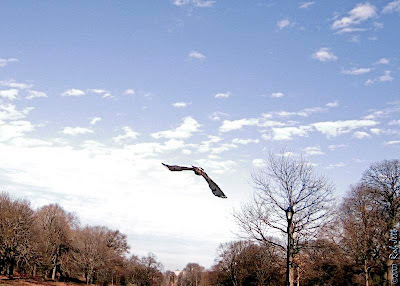 The chase ended up over the Ridgewood Reservoir where they twice locked talons. There was a big difference in the size of the two birds, so I assume they were male and female. The pigeons had resumed their synchronized maneuvers, but the falcons were so engrossed in their aggression towards each other, they forgot about the hunt. As a train approached the station, I watched the two peregrines disappear behind the trees at the reservoir heading north. The reservoir is nearly equidistant from 7 bridges. I wonder if the two falcons were from nests on any of those bridges. In the afternoon, and the following day, I walked around Prospect Park for several hours. It probably sounds silly, but I was looking around for any last minute additions to the park's 2007 bird list. I guess the urge to build a long list has carried over from my 2006 experiences. Nearly all the expected winter species were around the park's various habitats, although the woodlands seemed unusually quiet. On Sunday, my wife and I were at the Vale of Cashmere looking around for birds. It's a natural wind break and there's almost always a lot of activity in that area. An unleashed dog ran up the hillside and through the woods. Dozens of birds that I hadn't seen on the ground flushed. Perhaps the Northern Goshawk was still around and the birds were being extra cautious. Robin and I were walking back home from the Peninsula when I noticed a large lump in the trees near the Maryland Monument. 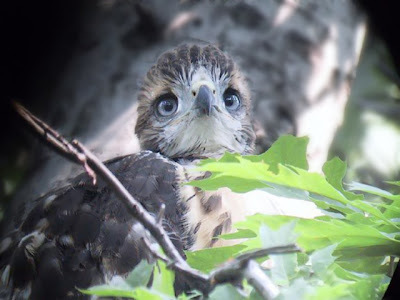 A young Red-tailed Hawk. My wife noticed a second one farther up the hill. We decided to walk up to the path that parallels Wellhouse Drive, to get a closer look. It took a few moments to located the perched red-tail. The second juvenile hawk was circling Lookout Hill a short distance away from the perched bird. Then, as if it materialized out of thin air, the goshawk flashed in front of us. She effortlessly weaved around the trees as the second red-tail attempted to harass it. The goshawk looped around the base of the tree where the first red-tailed hawk was still perched. She was less than six feet off the ground as she continued up the ridge and out of sight near the Butterfly Meadow. I've seen Sharp-shinned Hawks and Cooper's Hawks zipping though the woods plenty of times. 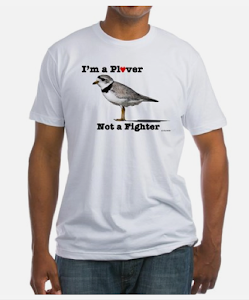 They are relatively small birds and they appear, physically, made for the job. The Northern Goshawk is a very large, bulky raptor that I wouldn't expect to be very agile. However, after witnessing the ease with which she navigated a path through the tangles of the forest ... my wife and I were blown away by the experience.